The Recovery Card protects a hard drive data from unintentional damage as well as from tampering with the system configuration. It recovers data lost from virus infection, running FDISK, re-formatting the hard disk, file deletion and tampering with files. 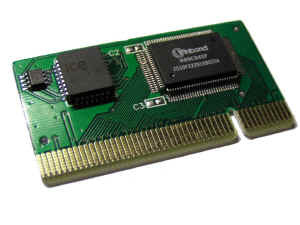 The Recovery Card completely resolve problems that many computer users sometime get great headache handling network system. It simplifies system administration by standardizing and improving the security for your PCs. With the Recovery Card installed, people can learn and practice commands like Delete, FDISK, and Format and be assured that the data and configuration is safe. Any lost data, files, or programs will be recovered just simplify reboot of the computer and click “restore” button. The Recovery Card also provides easy-to-use user interface and various management modes for simple operation. Are you looking for methods to minimize the maintenance time and cost for maintaining a good computer systems? The Recovery Card is the best choice. It also provides complete protection from all viruses by being able to automatically restore the hard disk after rebooting the computer (Recover all the deleted files/programs, formatted hard drives, changed CMOS settings) Support Multi-boot up to 30 partitions. Support 1 to 3 hard disk copies, track by track. Please note - the card may look slightly different than the one pictured depending on the most recent model released - all the features are the same. 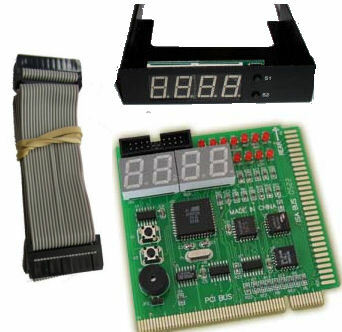 PCI Bus plug-and-play without any changes to the hard disk, the installation uses as little as 0.5% of the available hard disk space –which is negligible with today’s hard disk sizes. Recovers data instantaneously, as it simply forgets all the changes made. Wide compatibility support for Windows 95, 98, ME, NT, 2000 and XP, and support for the BIGDOS, FAT16, FAT32 and NTFS file systems. Support for BIOS protection and recovery of hard disk parameters and type. The Recovery card has a built-in VxD device driver of Windows 95, 98 and ME, therefore it does not need a floppy disk during installation and usage. On Windows NT, 2000 and XP a driver has to be installed. Support for automatic maintenance of all computers in a networked computer room. Maintaining a computer room is now just like maintaining a single computer. The Recovery card supports synchronization, remote on/off switching and automatic setting of IP address, computer name and user name. Support for multiple partition protection. If the hard disk is divided into multiple partitions, the Recovery card can protect all or any of the partitions. For example if the hard disk is divided in partitions C, D and E, protection can be switched on for drives C and E leaving drive D unprotected. Of course any combination of protected and unprotected drives is allowed. Support for high-speed access modes such as Ultra-DMA66 and ATA-100. Support for large hard disks with a capacity of over 100 GB. Support for hard disks with IDE, EIDE and SCSI interfaces. Preventing virus infection and destruction of protected drives, and can disable disk management tools and low-level formatting tools. No hard disk performance loss. Drivers and manual can be downloaded here.